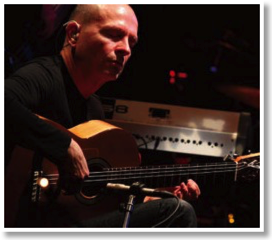 Celebrated guitarist Ottmar Liebert is a five-time Grammy nominee. He is not only prolific, but has managed to establish a passionate fan base all over the world, as evidenced by his 38 Gold and Platinum certifications. Currently, Liebert is on tour this summer. In a phone interview he chatted with Jupiter Index. Jacqueline Perrin: With 35 CDs to date, how does your energy or mindset differ in the studio versus a live performance? 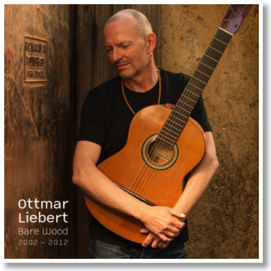 Ottmar Liebert: To me it’s quite different because a performance is ideally just for the moment. Whereas a studio recording will be listened to many times. So I’m definitely more observant of what I’m doing in the studio to make sure it is something that can stand up to multiple listenings. In the studio I can obviously do multiple guitar parts. Whereas, live I would have to find a way to play it all at once. You know, they’re very different. In the studio we often have multiple guitar parts, two or three bass tracks, and musicians on the recordings that aren’t on the tour. For example, the accordion on the last album, on Dune, we’ve never actually toured with an accordion. But I think that’s also something that I find that makes it more interesting. For us, and also I think for the fans, we have to figure out a way, how do we want to present this material? And that results in five arrangements, the arrangements for the tour. You will never hear us play, note for note, what is on the album. By the same token, you’ll always hear something interesting and something a little different from the album. It sounds like you can let go a little bit more in live performance. Do you have a preference between the two types of performance, or is it like comparing apples and oranges? Yeah I think it’s a completely different thing. And I really enjoy both of them. I enjoy crafting an album—and by crafting I mean to make sure that every rhythm guitar is exactly where it should be and making sure my performance works. And live I can just be in the moment on that stage in front of those people. And I actually like it very much that way. There’s obviously a trend in pop music, and sadly many other places, where people use computers or CDs to play additional music while they’re playing. You can have as many instruments as you want, but it ties you to a tempo, and I find that every performance, every stage, and every audience, the tempo should be for that moment, other than being aided by whatever backing materials you would want. So when people see us, they see a very simple, very real performance. We don’t change costumes. We don’t have a light show with fire. We don’t have dancers. We don’t have backing materials, so it’s just us playing. You describe the music of your [last] album, Dune, as “poetic sunshine at midnight.” I just love that sentiment. Can you elaborate on what that means? Well I didn’t describe it; a friend of mine who writes about music described it. If I were that good with words, I would write lyrics or poetry. I credit those to a friend of mine who heard the album, and that’s what he wrote. Do you think it is an accurate representation of what that music sounds like to you and what it means to you? I tend to think of music in a more abstract way. Hence, I don’t write lyrics. To me music is all about imagination. Take for example, instrumental music versus a song. Instrumental music for me is like a book. When you read a book, the description of a tree is just words on a page—absolutely meaningless until you grow that tree in your mind, and based on their experience, everybody will grow that tree in a different way. Have you seen that type of tree? Maybe a strange African or Asian tree. In which case you end up imagining it in all sorts of funny ways. You know, instrumental music is really a lot like that. It gives as much as you’re willing to put in. It can be sort of background, or you can make it into something unbelievable. I’ve spoken with music critics where I’m just absolutely flabbergasted. They knew what I had listened to. They knew what mood I was in. And sometimes it was done right there. Just from listening to the song. Whereas, a song with lyrics is really like a movie. With a movie you do not need any imagination. You’re being shown everything. You just need to follow the plot. There’s all there is to it. A song is really like that. The words tell you everything that it’s about. And I’ve always been a book person. I read 20 to 30 books a year. I really, really enjoy that. It’s really what instrumental music is like. That’s a great parallel. For this particular album, did you have a chief source of inspiration, or did you draw from multiple places? Well I never used accordion. I grew up thinking accordion was for polka music or some types of folk music. It wasn’t something I was naturally drawn to, but a few years ago I started listening to Raï, which is the pop music from Algeria. People like Cheb Mami or Khaled, people like that. I discovered that Cheb Mami, who most people might be familiar with because he sang on the song “Desert Rose” by Sting. He’s not only an incredible singer, (Sting used to introduce him as the best singer in the world. ), but he also plays the accordion. I listened to several of his albums, and I was beginning to be in love with how that sounded. I was speaking to my bass player (We’ve worked together since 1989.). I said, “Man, where can I find somebody like that?” He says, “I know somebody in Santa Fe.” So we talked, and I think it worked out just brilliantly how the guitar and the accordion interweaves and works together. Editor Note: This interview was completed before Mr. Liebert’s most recent album was released. He now has 36 records to date. Please read the second half of this interview in our next edition.